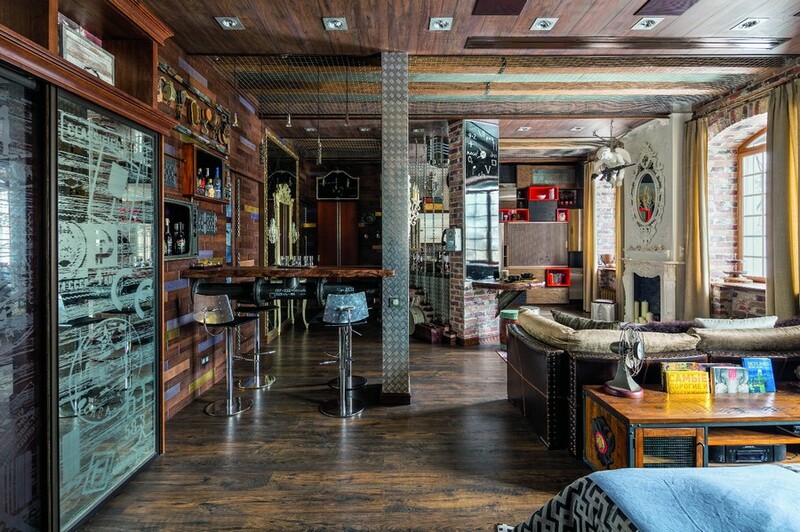 In this brutal room the space above the head is finished with a few different materials: ceiling beams are found next to decorative wooden panels with built-in lights and complimented with a wire mesh strung between. This is an unhackneyed interior solution: oak parquet boards are passing from the floor to the walls and then partially moving to the ceiling. 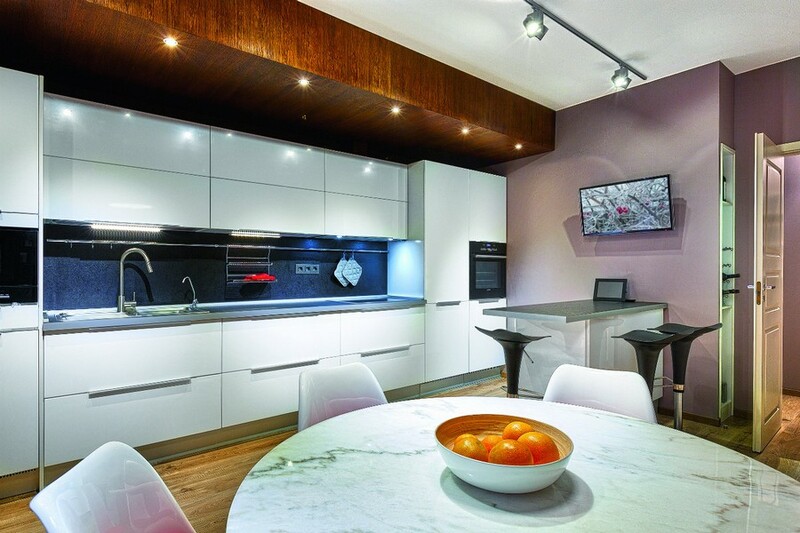 Thereby all the ceiling lights are built into plasterboards on both sides of the wooden surface. 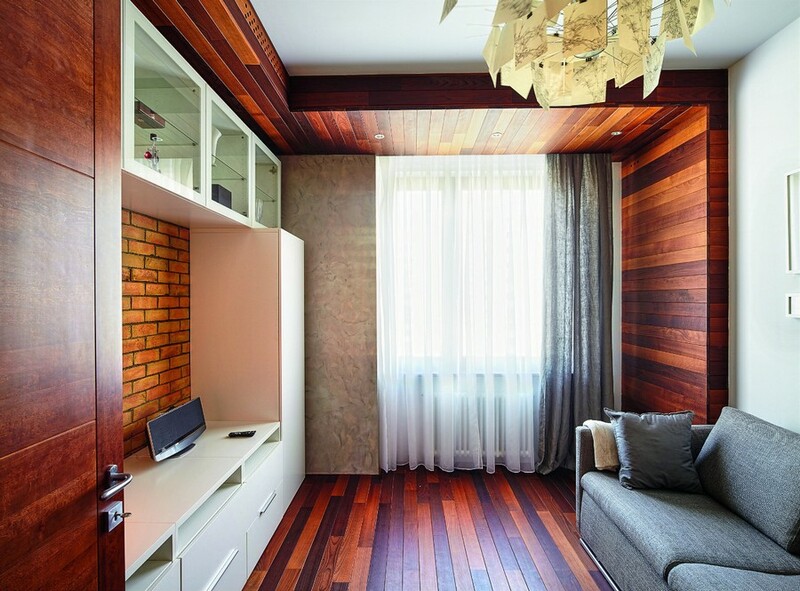 The use of parquet boards with wide contrasting longitudinal strips was not limited to the flooring only in this small apartment; the same décor can be found on the walls and ceiling. 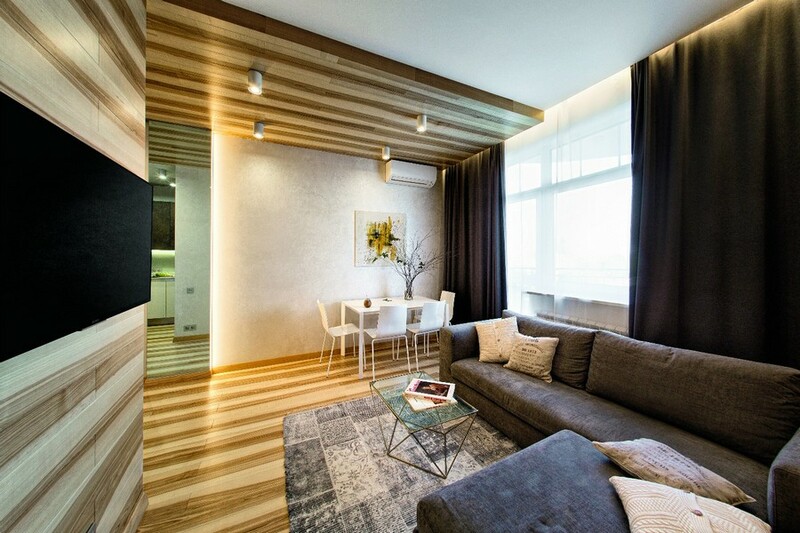 Enhancing the beauty of wood are light strips, which look like rays of sunlight penetrating from the window. 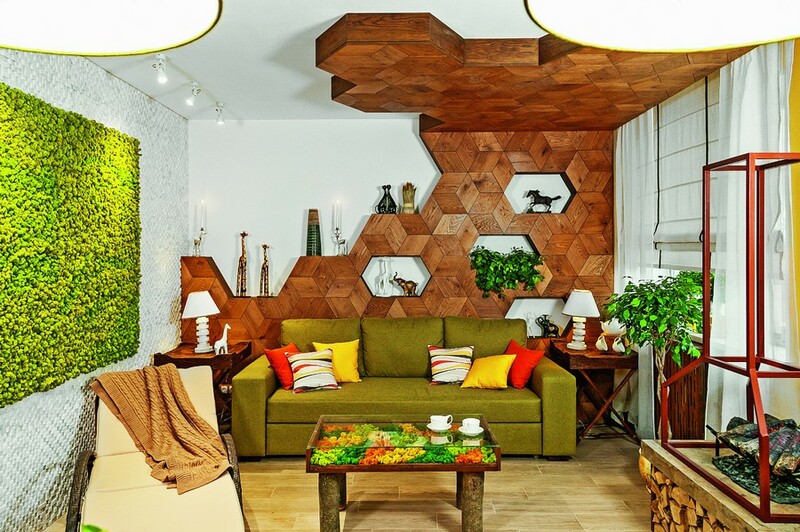 You have already seen this example of using natural wood in the living room interior in our previous post. A marvelous three-dimensional construction faced with oak panels is based on a mixed metal-and-chipboard framework. The symmetry of diamond-shaped modules composing a honeycomb pattern is knowingly broken to add the sense of dynamics to the composition. The walls and ceiling in the window area are finished with thermally modified wood of dark brown shade, which creates the sense of cottage house warmth and coziness in a typical urban apartment. 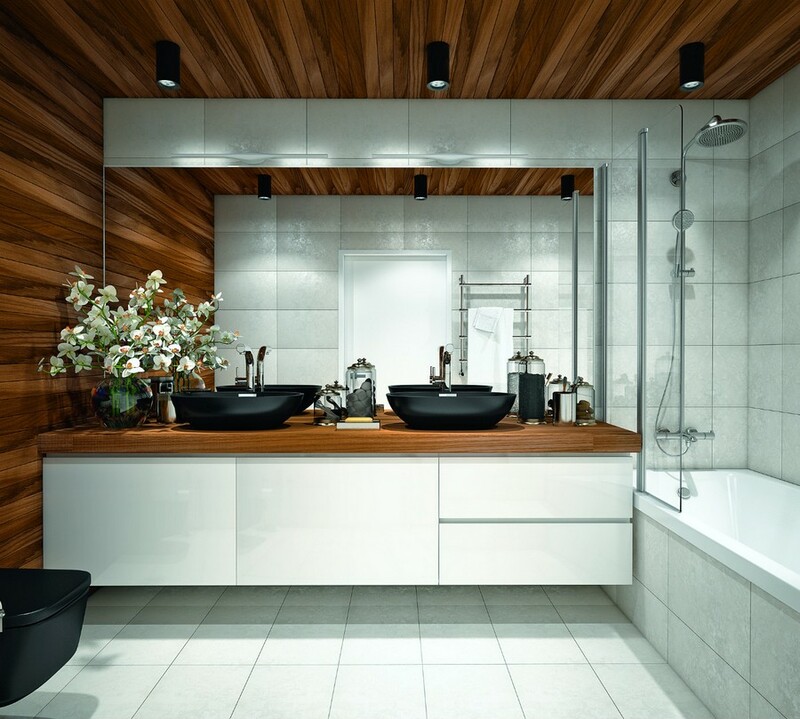 In bathrooms the surface above the head can also be decorated with wood. For instance, in this project wooden ceiling décor is continued on one of the walls and supported by the matching finishing of the countertop. Pay attention to the fact that the rest of the surfaces are either glossy white or mirrored, while black wash basins play the role of contrasting accents. 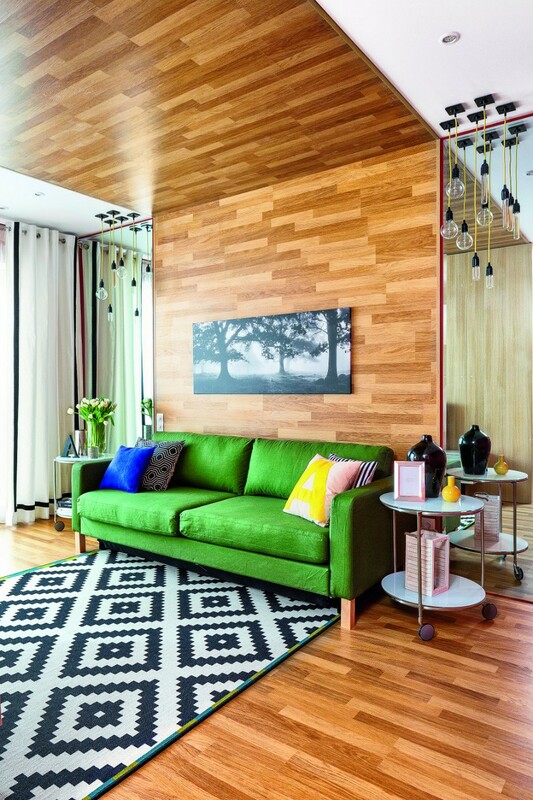 In this apartment the ceiling is finished with artificially aged wooden boards laid in a chessboard pattern. 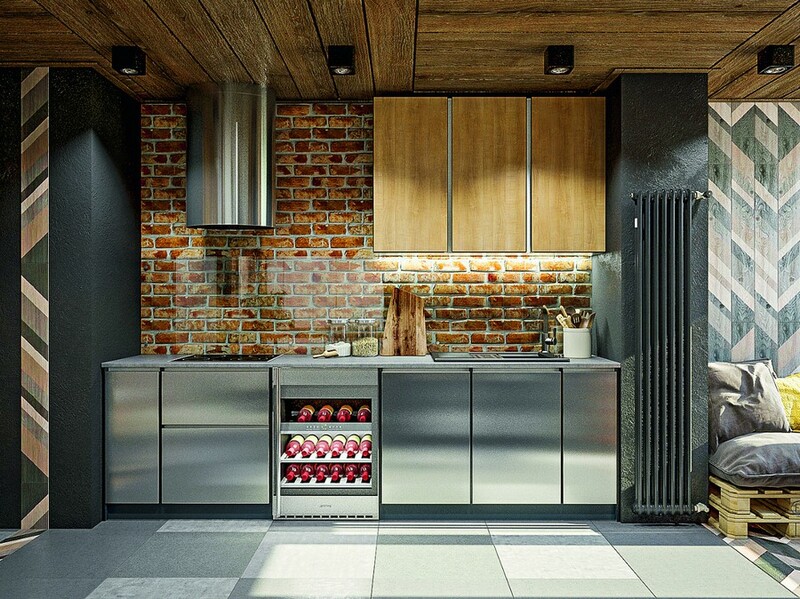 Such a solution is not just decorative, but also very functional: eco-ceiling décor conceals an air duct connecting the cooker hood with a ventilation skip. Here functionality also matters: the ledge of the ceiling beam was faced with dark oak panels, and inside this construction an air channel and lights were built in. 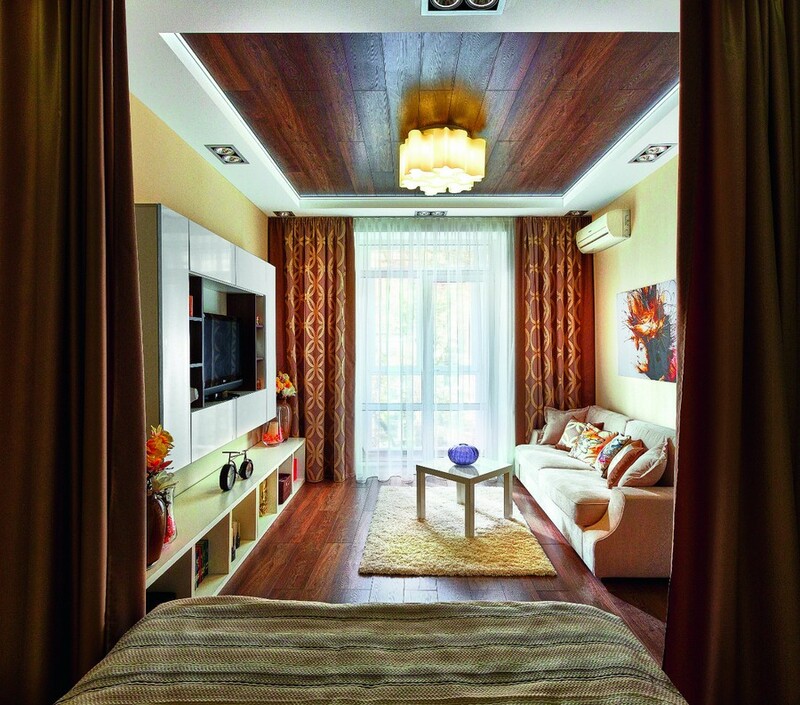 In this apartment non-standard ceiling décor was a tool for refreshing a quite reserved living room interior. The ceiling was partially finished with warm-colored laminate, and dropped along the perimeter for the sake of embedding a few lights. The middle of the wooden segment was accentuated with a beautiful chandelier with a visually weightless lampshade. 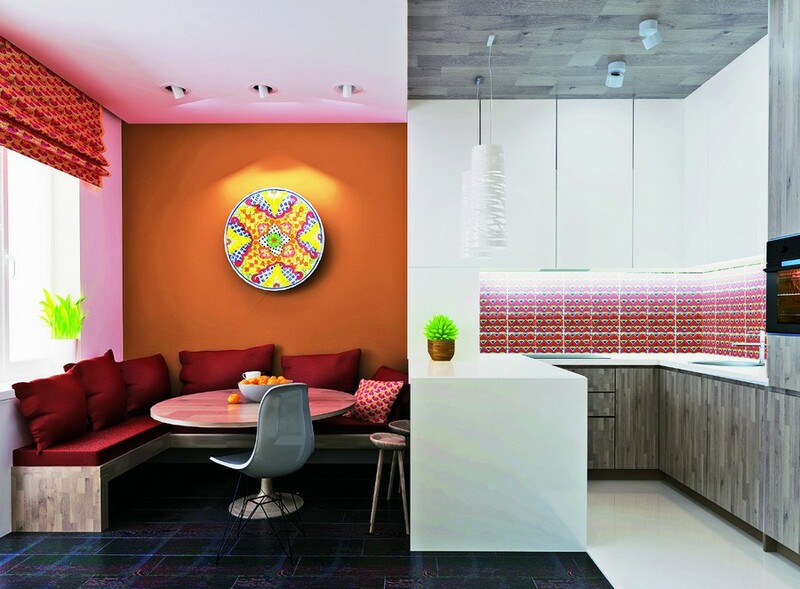 In this example different ceiling finishes are meant to define the visual border between the dining and cooking areas of the kitchen. For the sake of interior integrity the ceiling in the prep area is made in the same MDF that was used for base kitchen cabinets.